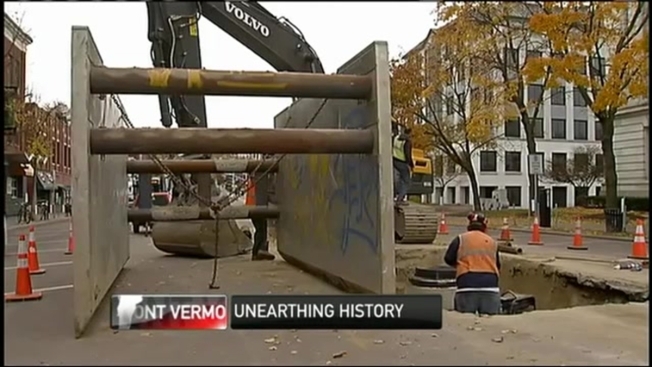 Regularly-planned sewer maintenance on Main Street in Burlington, Vermont unearthed a piece of the city's past this week. Burlington Department of Public Works employees who dug up part of the street to install a new sewer manhole discovered part of a network of old underground water pipes. What was unusual was the pipes were made of wood. The wooden pipe had been abandoned long ago, and had been inactive for a very long time, said Rob Green of DPW. "We immediately knew it was history," Green told New England Cable News. "We've all heard of wooden water mains, but this crew has never seen one." Green said he bets the wooden water line dates to about 1870. "We've come a long way in 150 years, from wooden pipe to cast-iron pipe to ductile iron pipe to now, plastic pipe," Green noted. Green and his team have handled a flurry of projects around Burlington in recent weeks, including the installation of new sidewalks, and the launch of significant improvements to the city's busy waterfront and bike path. "We're in better shape than most cities," Green said of Burlington's public infrastructure. "Is there enough money to [upgrade] everything at once? Never. But we do so much per year." At the federal level, Sen. Bernie Sanders, an Independent who caucuses with Senate Democrats, said he hopes infrastructure repairs will be a top priority in the new Senate next year. The Senate will see Republicans assuming a majority. "In my view, what we have got to do as a major, major priority, is create millions of decent-paying jobs in this country," Sanders told NECN. "And I think the best way to do that is rebuilding our crumbling infrastructure." As for Burlington's nearly-forgotten wooden water line, Green said he has learned of some Vermont communities that still use similar ones. Green's plan is to save a piece of the wooden system and display it. "We don't have an example of that anywhere around here," he noted.